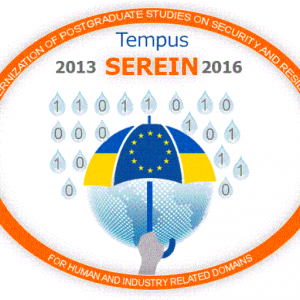 All materials, produced in the frame of TEMPUS SEREIN project «Modernization of Postgraduate Studies on Security and Resilience for Human and Industry Related Domains» (543968-TEMPUS-1-2013-1-EE-TEMPUS-JPCR) belong to the consortium of TEMPUS SEREIN project. This project has been funded with support from the European Commission. All publications on this website reflect the views only of the author, and the Commission cannot be held responsible for any use which may be made of the information contained therein. We do not sell, trade, or otherwise, transfer to outside parties your personally identifiable information unless we provide you with advance notice. This does not include website hosting partners and other parties who assist us in operating our website, conducting our business, or servicing you, so long as those parties agree to keep this information confidential. We may also release your information when we believe release is appropriate to comply with the law, enforce our site policies, or protect ours or others’ rights, property, or safety.However, non-personally identifiable visitor information may be provided to other parties for marketing, advertising, or other uses.